On paper, kids and tablets are a good fit. From their portability and their ability to entertain young ones through movies, games and the Interwebs, slates look like the perfect companion for children. In reality, however, the match isn’t quite so perfect. You’ve got horror stories, for example, of children racking up sizable bills when purchasing apps or in-game content. Younger children can also be rough on their devices, with tablets not precisely designed to withstand a ton of physical abuse. It was with this in mind that Amazon entered the children’s tablet space with its very own Kindle Fire HD Kids Edition. Sporting a colorful design, the Fire HD Kids Edition practically screams out that it’s a device targeted at little ones. So is the device mere child’s play compared to tablet stalwarts such as the iPad, Nexus 7 or Microsoft Surface? Here’s the lowdown on Amazon’s new slate for kids. Kids’ tablets can be like kids’ candy. They can be big on color and sugar but sparse in substance. I’ve seen my fair share of tablets that act more like toys, but the Kindle Fire HD Kids Edition is not one of those. Despite its colorful exterior shell, its insides are the same as what you’d see in a bonafide slate. It’s got a quad-core processor that serves as its brain, a high-definition display, and cameras both at the front and the back. It’s Amazon’s Kindle Fire HD wrapped in a more robust exterior. The Gorilla Glass display is beautiful but that’s par for the course with many tablets these days. 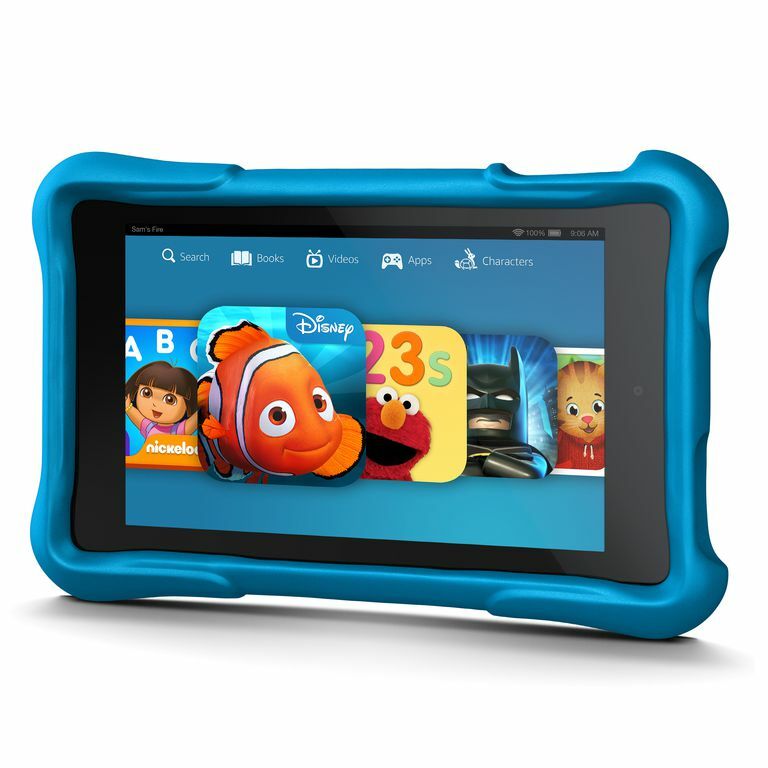 Instead, the “Kid-Proof Case” is what distinguishes the Kids Edition from the Fire HD and most tablets in general. The exteriors add a splash of color as well as extra grip for little hands. Its main job, however, is to withstand drops and all sorts of abuse. How well does it do that part of its job? Amazon is so confident that it’s throwing in a two-year free replacement guarantee in case your child breaks it. The warranty also covers electrical and mechanical problems with the device. It’s been said that content is king and Amazon tries to make that hold true for the Fire HD Kids Edition by throwing in FreeTime Unlimited for one year. This gives users access to more than 5,000 apps, games, movies and other content on the device. These include stuff from Disney, Nickelodeon, PBS and Warner Bros. In addition to keeping young ones busy; this also helps prevent sticker shock from the times when they inadvertently download paid content. Even with FreeTime Unlimited, you’ll still want to have controls that limit what your kids can do with the Kids Edition tablet and prevent potential accidents. FreeTime Unlimited is also a great reason to have parental controls because you don’t want your child turning into a zombie and spending way too much time-consuming media on the tablet. In addition to basic controls, you can create individual profiles for each child to customize the limits they have when using the device. In addition to its three colors, the Kids Edition is available in two versions. When they first launched, the 6-inch variant retailed for $149 while the 7-inch version cost $189. Since then, Amazon gave the tablets a significant price drop, with both now costing just a smidgen under one Benjamin at $99.99. Although the Kindle Fire HD Kids Edition sounds like a great device for kids, it does come with one big caveat that prospective buyers should know about. It ties you to Amazon’s App Store. This means no access to the better and more content-rich Google Play app platform used by other Android tablets. This is a big deal if you’re invested in apps from Google’s main app store. If you’re already tied to the Amazon ecosystem, however, and don’t mind the absence of Google Play, then the Kindle Fire Kids Edition is worth looking into.